One of the problems with making illustrated linear geologic timescales is that the middle 80% of the timescale generally looks fairly boring. Of course, all sorts of things were happening in the Archean and Proterozoic, but they ren't always as easy to sketch cartoons of as a trilobite. I'm currently doodling a cartoon illustrated timescale, and I was wondering. do any of you have any favorite Precambrian events that can take up the timeline space that would otherwise be white? If so, and you don't mind me stealing your favorites, please share. I read and watched a lot of science fiction when I was young. I don’t much any more, mostly because I’m too busy, but every now and then I have a relapse. Also, for the most part, real science is more fun these days. But they aren’t necessarily mutually exclusive. For example, this evening, I was thinking about the International Space Station. Under optimal viewing conditions, the ISS is the brightest thing in the sky, aside from the sun and moon. But while the station is surprisingly large (about the size of a football field), it is generally smaller than most science fiction spacecraft which are capable of interstellar travel. Science fiction generally depicts people walking around on the ground, or starships floating close above a planet, but with little connection between the two; The only time I can recall people on the ground seeing spacecraft above are when the Death Star explodes in Return of the Jedi, and when the remains of the Enterprise re-enter the atmosphere in Star Trek 3. But if you can see the ISS from here on Earth, then surely a larger science fiction (or alien) spacecraft would be brighter still. Figure 1. 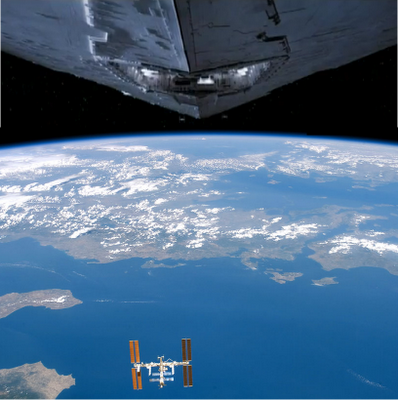 Since you can see the ISS from your backyard, you don’t need the force to detect something much bigger in the same orbit. Click for larger image. Thanks to Jeff Russell’s Starship dimensions, scaled profiles of most major starships can be easily compared to the ISS. That’s all well and good, and we can estimate areas and visual magnitudes in the -7 to -10 range for various popular starships. But since there isn’t anything of that brightness in our skies, it doesn’t mean much, except to tell us that they would be easily visible from the back yard of anyone looking for them (assuming they aren’t in Earth’s shadow). But there is a useful celestial yardstick. 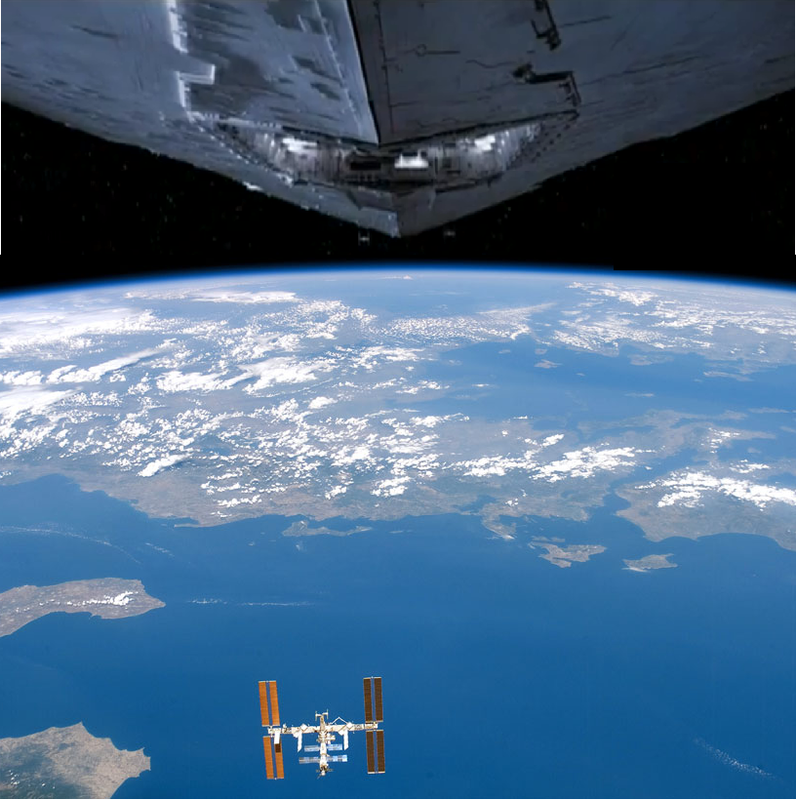 Figure 2. relative apparent sizes of various spacecraft (and the ISS) when directly overhead in a 350 km low Earth orbit, when compared to the apparent size of moon. The moon is of course 1000 times larger and 1000 times farther away. Click for larger image. 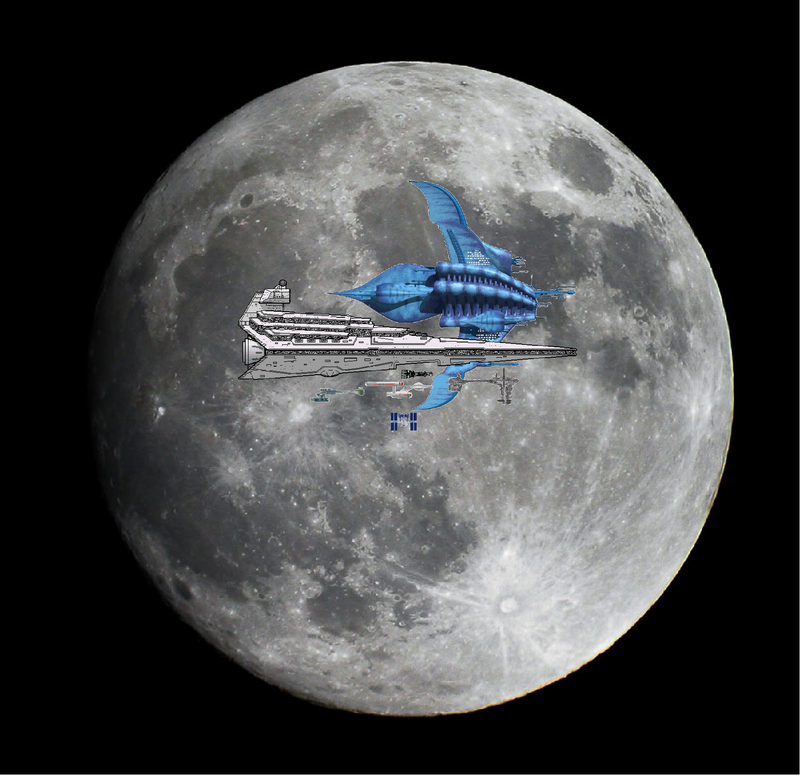 The Moon, which has a radius of about 1740 km, is about 1000 times farther away than low earth orbit. So a spacecraft 1000 times smaller- say, a flying saucer with a 1.7 km radius- would have the same apparent size when directly overhead. Thirty degrees above the horizon, it would appear half a big. In other words, the shape of kilometer-scale spacecraft, such as a Star Destroyer, or a Babylon 5 capital ship, would easily be discernable to people below. The 24 km-wide flying saucers from Independence Day would appear to be seven times larger than the moon, and would blot out the sun for up to 4 seconds as they passed in front of the sun. So forget all the garbage you hear about radar jamming and government cover-ups. When the alien invasion fleet comes for us, we’ll be able to watch it from the back yard. Figure 1 is from STS 118 and Return of the Jedi. The winner of the third annual Arctic sea ice prediction pool is “Isotopic”, with a winning guess of 4567 +/- 100 thousand square kilometers. As is usual, Isotopic’s prize is the chance to nominate a blog topic upon which I will try to write. Congratulations, and thanks to all who played. There is often an argument, usually heard from the math/ engineering wing of the global warming skeptic industry, which suggests that climate scientists are a separate and distinct group of researchers. A cabal who don’t do real science, and who train and study in isolation, cut off from the rest of the scientific endeavor. This is generally not the case. Most of the climate scientists I know started out doing something else. Some worked in the gold mining or oil & gas industries. Some studied the formation of continents, or the origin of granite. Some were volcanologists, or modeled deep mantle convection. A few were not even geoscientists at all, but came from disciplines such as chemistry, or nuclear physics. There are some people who go the other way, and move from climate science into archeology, or astrobiology. There are several reasons for this. First of all, the analytical tools used to study non-climatological processes can often be applied to climate questions. And more importantly, when scientific discoveries of all types are first made, it is not necessarily clear where that discovery will have the most impact. It is not unusual for something in a seemingly unrelated field to get picked up by climate research. There is also the funding aspect. Here in Australia, there has been an increasing reluctance to fund basic research. Most climate science is considered applied study, not basic science, so there has been a real trend for researchers chasing the funding dollar to go into areas like climate, mining, or forensics, where funds are easier to obtain. But the point is that as professional scientist wind their way through various scientific inquiries that lie on their career paths, they don’t turn off the analytical parts of their brains when there is a climatological implication to their studies. Ultimately, climate science is just like any other sort of science, and it is studies using many of the same tools and methods as the rest of Earth science. How long as the Atacama been dry? The Atacama desert, on the west coast of South America, is the driest desert on Earth. The high Andes mountains block moisture transport from the Amazon basin, and the cold Humboldt current offshorehttp://www.blogger.com/img/blank.gif provides little evaporative moisture. Dunai et al. (2005) attempt to determine whether the hyperarid conditions are ancient (early Miocene) or more recent (late Miocene) by looking at the cosmic ray exposure ages of easily eroded sediment. Cosmic rays are extremely high energy protons which are generated beyond our solar system (ask an Astronomer for details). The are energetic enough to penetrate the atmosphere and the first few meters of rock when they strike the Earth. When they do hit rock, they can create nuclear reactions between the atoms in the rock. One of the products of these reactions, 21Ne, can be measured using noble gas mass spectrometry. So the amount of excess 21Ne a rock has is proportional to how long it has been close to the earth’s surface, and the cosmic ray flux. Dunai et al. (2005)’s sample sites were specifically chosen to exclude areas where the outwash from the high Andes east of the desert would erode or cover the local rocks. Only local rainfall could erode the selected areas, so only local, medium elevation, near-shore precipitation (or lack thereof) was relevant to the erosion rates. Their results show that most of the rocks they sampled have been at or near the surface for 20-30 million years. These are among the oldest exposure ages in terrestrial rocks. The implication is that there has been negligible erosion since that time. On the other hand, I wish the paper made more of an effort to explain why the results given were not within error of each other. Call me old fashioned, but a data table would be nice as well. The other question that they ask is which came first, the aridity or the uplift? It is easy to see how uplift causes aridity- the rain shadow gets stronger. How aridity causes uplift is less obvious, and the reference given is not available on this aircraft. But the general idea (based on context) seems to be that with no fluvial input to the subduction trench, it accumulates very little sediment. Without sediment, the rocks are stronger, and can withstand more stress, pushing the mountains higher. The problem with this conclusion is that it requires knowing the sediment flux from the entire drainage area. Presumably the sediment transport would be controlled mainly by erosion of the high (and higher precipitation) Andes. Dunai et al. (2005) specifically chose a site that did not record the sediment flux from the eastern, mountainous part of the drainage basin. Instead they chose to focus on local conditions. By excluding the most important potential sediment source, they put themselves in the worst possible position to answer questions about sediment transfer in the rest of the Atacama desert, including total transport to the trench. The title of this paper does not reflect the sort of study which I would like to see done on this material. Please instruct the authors to change it, instead of using the title to push their own agendii. While the paper is nominally about solid solution in simple oxides, the narrow focus of the introduction has resulted in a failure to cite the well-known avian migration papers of Lemming et al. (2003), and Lemming and Aardvark (1998), both of which ought to be mentioned for completeness. Without tying mineral solid solution to bird migration (ibid), econometrics (Lemming and Wesson 2002), and mass spectrometry Lemming et al. 2009), the author fails to cite as wide a selection of my papers as he otherwise could. This indicates an inability to place the science in the broader context of society. Without this context, their results are neither novel nor interesting. Like the title, the methods of this paper fail to pursue the angle of inquiry which I would have used, had I their skillsets and funding. This is obviously a serious error. Please require the authors to have done something other than the experiments whose results they are reporting. They would do well to cite Lemming et al. (2009) for the analytical procedures I prefer. In the first experiment, where the precision is twice as bad as Lemming and Stoat (2006), the data is obviously not precise enough to be worthy of presentation. The second experiment, with precision twice as good as Lemming and Stoat (2006), is obviously too good to be true, and must be the result of incorrect error propagation or outright forgery. Once again, the lack of citations to my unrelated papers is a serious flaw. In addition, the authors insist on drawing conclusions based on their data, and not my preconceptions of where the field was 15 years ago. Ignoring the work that they misguidedly performed renders the rest of their study irrelevant. In fact, their constraints and discussion of the experiments they DIDN’T do is practically nonexistent. This is clearly unscientific. There is a problem of nomenclature as well. The proposed mineral name in this paper is completely unacceptable. I require the authors to name their new mineral after my pet hamster instead. While this paper is not suitable for publication in a top rate journal, it will be perfect for your rag, providing that the above revisions are undertaken. How do extinction events kill so effectively? The dinosaurs are still alive! This was the conclusion reached by a group of my fellow undergrads way back in the Pliocene when I was in college. As an independent study project, they investigated all the possible effects of a giant meteorite impact (dust, fires, tsunami, etc), and concluded that none of these effects had the reach or duration to cause widespread global extinction. Indeed, the actual kill mechanism is generally armwaved and/or hyperbolized (no sunlight for months, scorching acid rain, death from the skies!) under the circular reasoning that, “since everything died, these effects must have been lethal.” Understanding how entire niches get wiped out as actually rather tricky. Enter Kump et al. (2005), who described a possible kill mechanism; poisoning from massive releases of H2S gas from an oxygen-starved ocean. In the absence of oxygen, bacteria will happily metabolize sugars by turning sulfate (SO4--) into sulphide (S--), with the oxygen liberated form the sulfate used to burn sugar into CO2 + H2O. In the absence of iron or other base metals, this sulphide becomes H2S in an aqueous system like the ocean. The ocean is full of sulfate; it is the second most common dissolved salt anion, after chloride. So under oxygen-free conditions, generating significant amounts of H2S is easy. Once this H2S mixed with oxygen-rich water, it oxidizes back into salfate. Water with significant H2S content is called “Euxinic”. While the modern ocean is well oxidized throughout all, but a few closed basins like the Black Sea, in the geologic past some or all of the deep water may have been euxinic. In their study, Kump et al. (2005) do two things. First, they determine the conditions under which H2S-bearing waters can upwell to the surface faster than oxygenated near-surface water can break down the H2S. This is important because oxygen and hydrogen sulphide react easily in water, but if the H2S exolves into the atmosphere, then it can co-exist metastably with O2 gas in the air. The second thing that Kump et al. (2005) do is to chemically model what happens to this H2S once it gets into the atmosphere, how it is broken down,. and what other changes occur as a result. Because H2S and O2 do not directly react under normal atmospheric conditions, H2S oxidation in the atmosphere in generally performed by the OH and O radicals, which are in turn generated by the UV or radiological breakdown of H2O and O2 molecules. These are the same radicals that breakdown methane (CH4), carbon monoxide (CO) and many other metastable gasses. What Kump et al. (2005) find is that if the H2S flux into the atmosphere exeeds the present flux by about a factor of 1000, then the H2S accumulates after than the OH and O radicals can break it down. This leads to a step function increase in H2S atmospheric lifetime and concentration, and a drop in O and OH abundance. This depletion of O and OH, in turn reduced methane breakdown, so that methane concentrations and mean atmospheric lifetimes also increase. In addition, the lack of O means that ozone production is curtailed, so the ozone layer is reduced. The combination of reduced ozone protection and direct H2S toxicity is touted by Kump et al. as a highly effective kill mechanism, especially for land creatures and sea creatures in the near-surface waters. Kump et al. then go on to show that there is evidence for anoxic waters reaching the surface during a number of Phanerozoic extinction events, and further hypothesize that the widespread euxinia in the Proterozoic inhibited the development of land life as a sort of “permanent extinction event” condition that persisted for most of Earth’s history, until mysteriously disappearing in the Cryogenean. The H2S-based kill mechanism (catchily coined as a “chemocline upward excursion”) is way outta my field of expertise. So I don’t know if there are reasons outside of my knowledge base to reject it out of hand. However, the nice thing about this paper is that it proposes a mechanism with specific, testable effects which we analysts can go looking for. While determining paleo-ozone and methane levels could be a bit tricky, the study of paleoeuxinity is a significant and ongoing field of study. I don’t know if this paper has withstood the test of time, but I suspect that it has inspired a whole slew of clever experiments. What more could we ask of the theoriticians? PRESSURE OF 968 MB. THE INITIAL INTENSITY IS KEPT AT 75 KNOTS. POST-TROPICAL IN ABOUT 36 HOURS. WITH AN INCREASE IN FORWARD SPEED FOR THE NEXT FEW DAYS. EASTERN HEMISPHERE BREAK A LOT OF SOFTWARE. We are talking about conference posters here, not posts on blogs. In general, there are two main types of presentations at scientific conferences; talk, and posters. Talks are generally supposed to appeal to a large number of people, and feature limited feedback between individual audience members and the speaker (aside from the occasional front-row tantrum, of course). Posters are generally a more personal affair, wit the poster presenter and the one or two people listening engaging back and forth for as long as it takes to settle their differences. Back in the good old days, when Demetrodon was our most advanced predator and mollusks ruled the seas, posters stayed up for the entire conference. This was great, because speakers could put the nettle gritty details of their methodology on their co-authors posters, and posters that describe methods used in a number of different talk sessions could all be centrally located. When I gave a poster at Goldschmidt in 2006- my last presentation before starting work in exploration, I had one person come by during the dedicated poster presentation time, Monday morning. But as the conference continued, and more and more people discussed interesting science based on what the lab was doing, more and more people started to swing by and discuss things, or ask me to walk them through the poster, and by Friday afternoon we had engineers from different mass spectrometer factories dueling with whiteboard markers of the the details of the ion optics. Nowadays, this can’t really happen. At all of the major conferences I have been to since then, posters have been a one day affair. They are put up the day of the discussion, and taken down afterwards. And I reckon that this is an inferior system. Firstly, it makes coordinating posters that related to multiple sessions difficult. Even within a session, if the timing of the talks and posters are not arranged well, you can have a speaker referring people to details in a poster that has already been taken down. Of course, the flip side to one day posters is that you can halve four times as many of them, with commensurate increases in attendance (and fees?). But is it really necessary to bring more and more people together for less and shallower interaction? I thought that was what the internet was for.